Allihes, Co. Kerry. By Eoghan Kavanagh. Photographer Eoghan Kavanagh on the Irish landscape. I began to work as a freelance photographic assistant in New York City twenty years ago. It was a wonderful opportunity but I could not settle, and eventually I returned to Ireland. What I did not know then, but I know now, is just how powerful a draw the Irish countryside has for me. A short while after I returned, I borrowed my father’s car and went to the west to take my first serious landscape photographs. For the next ten years, I continued to take trips mainly to the west of Ireland and combined them with a career working as an advertising photographer. Eventually, I made the decision to set up my own gallery and sell limited edition prints to support my ongoing project to capture the landscape the way I saw it when I first returned from the U.S.
One of the most popular images in my gallery today, “Tree Lake,” was taken on that first trip. It was the first image I put in the window of my gallery, the first image I sold in my gallery, and coincidentally, the night after I took that image, I stayed in a room over a pub in Kenmare that is directly opposite where my gallery is now. I have worked the same way since I began taking landscapes. I spend a lot of time researching a location, deciding on composition and what I need in terms of light, wind direction, cloud, mist, fog, and rain. All of the different weather conditions affect the final image. I work exclusively on film and use a large format 4×5 wooden field camera. The intricacies and the challenges of working with film make the images more special. This is Allihies, a village on the Beara Peninsula. As they do in lots of villages in Ireland, the people here paint their houses in different bright colors. I really wanted to bring this out in the image and that’s why I wanted the dark sky. I also like the way the houses are dotted in the landscape. You can get a real sense of scale when there is a house in an image. It is one of my newest images and it was in the planning stages for over a year before all the variables came together to create the perfect scene for me. It is a strangely colorful place and I wanted that stormy sky, which invariably comes with flashes of light as the clouds open up for a short period of time. These three images are of the same Hawthorn tree at Lough Brinn. Five years elapsed between the first one, taken in the fall, and the last one in the winter, and you can see the branches of the tree have gotten a little bigger. I am interested in the passage of time as it affects the landscape. We got an early snow that winter, so you can see the red berries peeping through, as if it had been decorated for Christmas. There are lots of myths that surround the Hawthorn tree and it is considered extremely bad luck to break even a branch. When I photographed the tree in summer it was as if it was lit with a halo of light. I took four days to shoot the image as I wanted the flowers at their maximum bloom. The fall image was taken after a very mild winter and an unusually wet summer. I have not since seen so many berries on the tree. 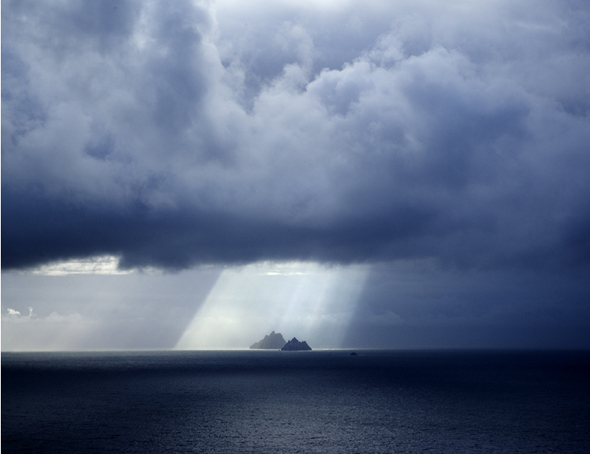 The Skellig Islands. I like to photograph that line that marks the sky from the sea. It is, in fact, how I came up with the name “Skyline” for my gallery. This image was shot on a day when the clouds were flying by in a very strong north westerly wind and it was just a matter of setting up the camera and waiting for a few hours for the light to approach. This is as close as I have gotten to the islands – I took this photograph from the mainland – however I do have plans for a three-day trip soon. Living in Kerry has been a great thing for me and has given me the chance to capture some amazing images. People have a hard time believing my photos are not retouched, but it is not a difficult thing to do if you watch the weather, know what you are doing, and where you are going. The Healy Pass on the Beara Peninsula has been photographed many times and it is very important to me that my work does not replicate what has been done before. This image was made on a typically misty day that offered just the occasional bright patch of blue, which gave me the contrast I needed to lift the detail in the mountain road. I love the way the road curves and then disappears into the mist. It is one of my favorite images and it proves that bad weather days are sometimes the best days to make landscapes. If you only take photographs on nice days all your images will look like everyone else’s. “Tree Lake.” Sometimes it takes years before I am actually happy with an image, but this is one of the first images that I captured on my return from the U.S. It was taken in Killarney National Park and I have not since come across such a perfect scene. It was a calm, frosty morning, the light was just up and it was still quite dark. The later images from this shoot look totally different – all frosty and blue with a bright blue sky, but the mood of this dark morning is what I like. 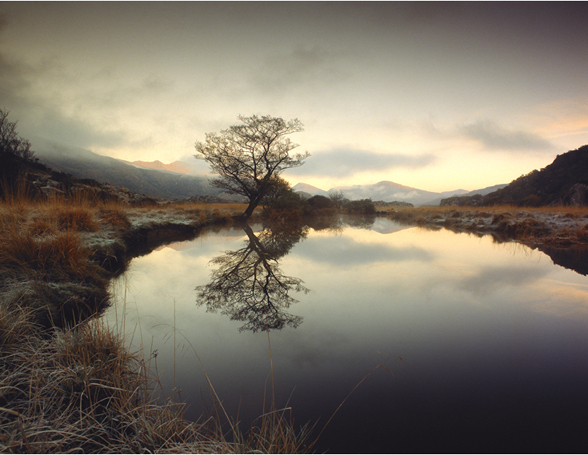 For more information on Eoghan Kavanagh’s photography or to purchase prints, go to http://skyline.ie or visit Skyline Gallery, 27 Henry Street, Kenmare, Co. Kerry. The trip to the Skelligs that Eoghan mentions above is seeking funding via Kickstarter. http://kck.st/L3ErEr There are some excellent rewards available. Are your beautiful photos sold in the US? If so, where may I buy them? Just a wee point. Your wonderful image of Allihies with the low clouds is listed as being in Co. Kerry. Actually Allihies and the Beara Peninsula is in Co. Cork! I spent many, many summers there growing up… this is a very evocative image. Well done! these are great. thanks for being a rebel of the camera, actually taking time and expending effort to make pictures. that ‘s laughably out of style now and the dearth of good pics confirms it. these are like good satisfying food; our eyes have hungers, too.